Home News Irresistible for young people: Is there someone who does not want an iPhone? Irresistible for young people: Is there someone who does not want an iPhone? The iPhone is much more than a phone , there is more to see the queues that are mounted on the outskirts of the Apple Store when Apple launches one. Without going any further, it is an aspirational phone, as it can be for many to buy a Rolex or Porsche, yes, much more affordable. So much so, that the iPhone is by far the most popular phone among young Americans, according to Piper Jaffray's semi-annual survey and which Macrumors echo. According to this survey, 82% of the young people interviewed had an iPhone , a percentage that has grown compared to 78% of the previous year. And it will still grow more, judging by the 84% of them that expect to have it soon. The Apple Watch also raises passions among teenagers and in fact, is behind only behind the Rolex, there is nothing. 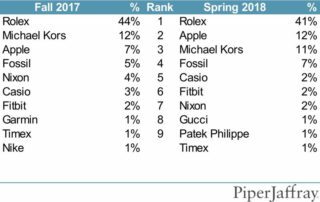 20% of the young people interviewed aspire to buy Apple's smart watch this year. This 2018 Apple will surprise with an Apple Watch Series 4 that will finally bring a change in design , which will attract even more excitement and as for the iPhone, 3 are expected and it is probably the low cost iPhone that awakens more passions . Piper Jaffray has interviewed 6,000 adolescents with an average age of 16.4 years and an average family income of $ 66,296, with 55% of boys and 45% of girls over the total. Of course, Apple is assured of success in the coming years with this faithful public . When we see these figures so high in the United States, we understand why Apple has the ascendancy that it has in American popular culture , the predominant one in the first world, but we can not help but think what it would be like in our country. The iPhone is one of the best phones on the market and, who would not want the best? Thus, it is not surprising that most young Spaniards also aspire to have one. Another thing is to have it. And it is that neither the Spanish per capita income is the same as that of the United States nor the price of the iPhone is the same , being increased by indirect taxes or import logistics costs. So it is not surprising that considering the exacerbated use and the treatment to which they are going to submit to their phone, many parents opt for other more affordable alternatives , opting for the low and middle range of Android. However, there are also interesting alternatives such as reconditioned iPhone or older models such as iPhone SE or iPhone 6s. After all, in adolescence it is normal to be capricious and it would not be unreasonable to think that some kid with the iPhone 7 has wanted to jump to the iPhone X, accelerating its "programmed obsolescence".